It's always risky to identify the location of a shot a half-century later, especially when cityscapes have changed so much in the meantime. This appears to be the New York Central's Fall Brook Line in Corning, New York, just south of the Chemung River bridge. The highway bridge passing overhead would be the South Bridge Street overpass. 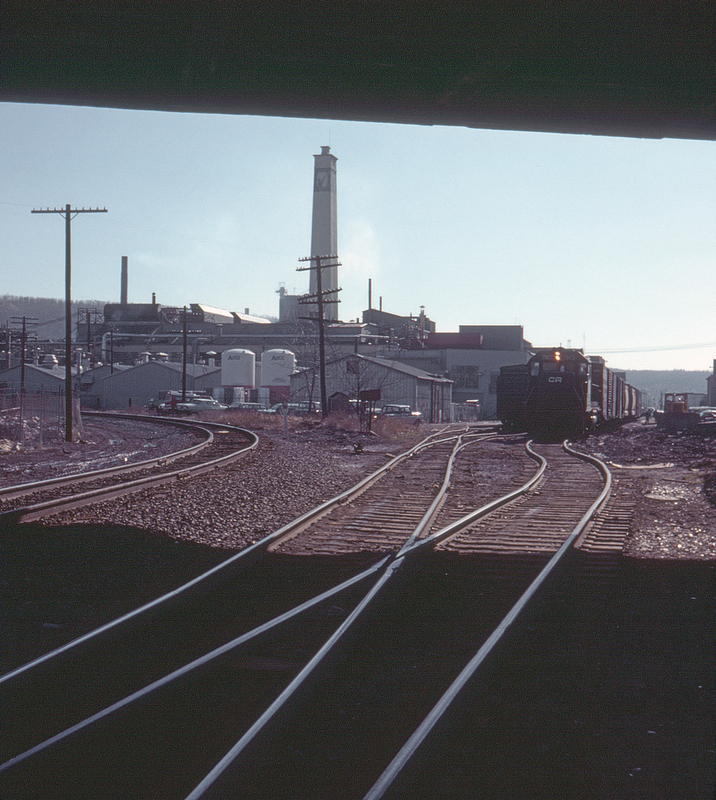 The line to the left is the main line north across the Chemung River to a connection with the New York Central mainline at Lyons, New York, while the line ahead is industrial trackage serving part of the Corning Glass complex. Behind the camera the line extends south through Pennsylvania, traversing the famous Grand Canyon of Pennsylvania on its way to the Clearfield coal district and ultimately connecting with the Oil City branch.